(NaturalNews) A mysterious wave of animal deaths that kicked off at the start of 2011 is picking back up in China, where tens of thousands of farm animals and wildlife have turned up dead in the communist country's waterways in recent weeks. According to reports, the mass die-offs have affected mainly rivers and tributaries around the densely-populated Shanghai region, and the death count thus far includes tens of thousands of pigs, roughly 1,000 ducks, and at least five black swans. Following these discoveries, some hog farmers from around the area told news outlets that this seemingly inexplicable die-off is actually the result of black market swine dealers dumping their illicit stocks in the water to avoid getting caught. Local police, according to reports, have been cracking down on the growing underground swine trade, which involves the off-the-books sale of diseased or already-dead pigs to buyers who turn it into food illegally -- pork products in China, according to the law, must be made from healthy animals. Others are claiming the pig predicament is the result of an upsurge in industrial pig farms throughout the region, many of which are flouting the law by dumping substandard pigs into the river rather than disposing of them properly. According to one government-controlled media outlet in China, the thousands of dead pigs being found right now in the Huangpu River are the result of "local pig farmers who lack awareness of laws and regulations." Is China purposely killing off pigs to avoid pork inflation? How does this relate to China's current situation with all the dead pigs? 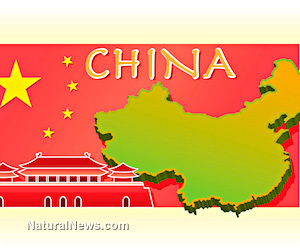 According to a ZeroHedge.com writer who goes by the pseudonym of Tyler Durden, China is well aware of the fact that the U.S. Federal Reserve's ongoing money printing spree (quantitative easing) is going to affect the prices of goods and services in China, where U.S. debt holdings are extremely high. And all the excess liquidity created as a result of the expanded U.S. money supply will eventually trigger inflation in China, where a lot of U.S. dollars end up, and from where a lot of U.S.-destined products are exported. Since pork is China's most popular food product, the government there may very well be manipulating pork stocks to prevent this precious national asset from spiking in price and causing panic and chaos. By essentially grossing the Chinese people out with thousands of dead, floating pigs in Shanghai's water supply, government officials may be trying to temporarily thwart the inflation of pork prices by deterring people from buying it, at least for a little while. When considering the fact that, of all the available meats on the market, pork is expected to rise in price at the fastest rate as we move into the future, Durden's hypothesis about the Chinese government's role in the mass pig deaths is definitely a possibility. But this widespread revulsion to pork cannot last forever, regardless of whether or not the Chinese government is actually involved in triggering it, and it does not explain all the other mysterious animal deaths that have also occurred recently. It is no secret that China does not exactly have the best reputation for environmental stewardship and responsible industry practices. Besides being one of the most heavily-polluted nations in the world, China has also been responsible for causing some of the worst consumer product scares in recent history, including its export of children's toys tainted with lead, for instance, and infant formula contaminated with melamine. With these and many other scandals in mind, it is hardly surprising that pigs are not the only animals now turning up dead in China's polluted waters. Just days after authorities had cleared out more than 16,000 dead pigs from the Huangpu River, roughly 1,000 dead ducks were discovered in the Nanhe River in China's southwestern territory, which is far from Shanghai. Just like with the pigs, authorities were quick to dismiss the possibility that the dead animals were any type of health threat to local residents. But according to reports, it is unknown precisely why these animals died.